Luwowo Coltan mine near Rubaya, DR Congo, is one of several validated mining sites that guarantee conflict-free minerals. During the early days of globalization, it was relatively easy for corporations to either hide, or be ignorant of, human rights and environmental atrocities committed along their supply chain. Factories and producers were shifting manufacturing or sourcing of raw materials to an increasingly complex network of suppliers, but there was no incentive to look into how a supplier produced, for example, raw cotton or shoe soles. As long as the price was cheap and the quality was good, companies saw little need to ask further questions. That changed, though, in the early '90s, when nonprofits and journalists began to undercover vast labor and environmental issues connected to suppliers of large corporations, shining a spotlight on the dark side of the global consumer market. This led to the development of an array of supply chain technologies -- RFIDs, remote sensing, satellite monitoring, even blockchain-based tools. Many were marketed as solutions, aimed at making it easier to monitor and respond to human rights and environmental violations along supply chains. The results, however, have been mixed. "I applaud the efforts that NGOs [non-governmental organizations] have made," said Michael Rohwer, Information and Communications Technology Associate Director at Businesses for Social Responsibility. "We would not see companies making so much effort [without NGOs]." One of the issues that NGOs helped bring to light was about conflict minerals, which fueled the Congolese Civil War of the 1990s -- widely considered the deadliest war since World War II. 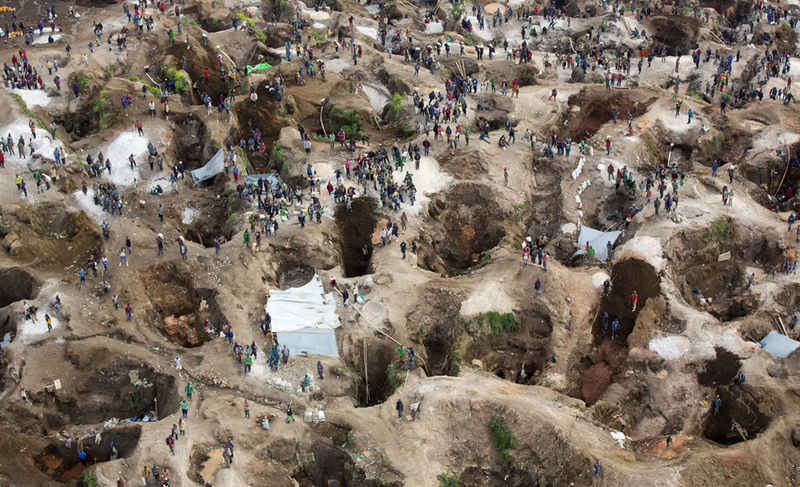 Evidence grew that many of the minerals being mined in the Democratic Republic of the Congo ended up, after trading hands countless times, in factories producing goods for major US technology companies. Smartphone, laptop and tablet sales were partly to blame for a conflict that was killing millions. In 2010, activists achieved a major victory when the Dodd-Frank Act was passed with the inclusion of Section 1502, which mandated companies to do due diligence and report if their products contained conflict minerals to the Securities and Exchange Commission. This was followed shortly by the passing of the California Transparency in Supply Chains Act, which went even further and required all large companies doing business in the state to disclose their efforts to eradicate slavery and human trafficking from their direct supply chains. Thinking about change was not enough. "[These laws] really caused companies to think more about how they could collect information about what is necessary to drive transparency in the supply chain," said Rohwer. Thinking about change was not enough. In 2015, analysis of these disclosures found that three years after the regulations had passed, few companies could accurately source their minerals. That same year, massive wildfires fueled by rampant deforestation connected to palm oil, the most consumed food oil in the world, burned 2.5 million hectares of rainforest. And this happened just two years after the horrific Rana Plaza factory collapse, in which more than 1,100 people -- mostly women -- died while producing clothing in unsafe conditions for global brands including Joe Fresh, Primark and Benetton. A forest fire in Riau, Indonesia. It turned out that fixing supply chains was a lot harder than expected. One of the early complaints, and reasons that many companies could not fully comply with Section 1502, was the sheer difficulty of mapping those intentionally complex supply chains. "There is definitely a decline in leverage the further away you are from a particular company," said Rohwer. "Even two degrees of separation is enough to change the leverage formula." In response to both the documented atrocities and the new laws, a plethora of tools meant to illuminate supply chains emerged. On the hardware side are technologies like RFIDs, which can increase supply chain visibility, and newer tools like Stardust, a dustlike tracker that helps assess the authenticity of goods along a supply chain and is nearly impossible to detect and alter -- some believe it could address illegal timber. There are also software tools that allow for better aggregating, analyzing, visualizing and verifying of supply chain information, like Global Traceability's Radix Tree, a platform that enables buyers to collect information from suppliers to establish a chain of custody. The latest trend "revolution" in supply chains is blockchain, the digital distributed ledger that powers Bitcoin. "We're seeing a lot of progress in attempts to utilize technology ... For many of them, however, the jury is still out on how effective they can be." There is even a conference, SCTECH, which promises to "[empower] Supply Chain Executives to make informed decisions and select the right technology for their business processes." But while technology is driving change across the industry, some question whether these high-tech solutions are actually helping create a transparent and ethical supply chain. "We're seeing a lot of progress in attempts to utilize technology," said Kilian Moote, Project Director for KnowTheChain, a Humanity United project. "For many of them, however, the jury is still out on how effective they can be." One of the areas that has seen the most positive media attention is remote sensing, at the forefront of which are companies like Orbital Insight and Descartes Labs, which both see potential for their technologies to help fill information gaps in supply chains around the world. The technology itself is getting far more powerful: Satellites are both increasing technological capability in quality (the amount and breadth of data they can collect) and quantity (how often they can collect data over a piece of the earth). This has led to some important breakthroughs, such as the Global Land Analysis and Discovery (GLAD) alerts system launched by the nonprofit World Resources Institute, which works with Orbital Insight. GLAD automatically analyzes data and sends alerts when a particular region in the tropics looks like it is being deforested. So far, though, the applications of satellites to make information more ethical and transparent has been limited to a few initiatives like GLAD. Mostly, companies are using satellites for other purposes: to better understand crop yields or to spy on a competitor's supply chain. Orbital Insight and Descartes Labs are focusing primarily on the commercial applications of their products first and not yet doing much on the ethical side, though both plan to. In fact, many of these tools showcased at conferences or in press releases are not yet being utilized on a wide scale. "There are promising concepts. The question is, will they move beyond pilots, and can they get to a place where wide-scale adoption is not only possible but actually happening?" said Moote. "And at that point we'll know if there is a market for these tech solutions." Technology cannot be a solution by itself. All it can do is provide better information -- perhaps more-accurate information, perhaps more-actionable information, perhaps better-organized information, but in the end just information. And sometimes information alone is not enough. Sasha Lezhnev, Associate Director of Policy at the Enough Project, a leading NGO that helps raise awareness about conflict minerals, believes tools need real human support to be effective. "Technology can help on conflict minerals, but it has limitations," said Lezhnev. "For example, digital scanning of minerals can improve tracing at mines, but human intelligence is needed to verify claims of minerals traders of being conflict free or not." Without the latter, the former is not useful. While change has been made by a few companies like Intel or Nike, it is not happening quickly enough and is not widespread enough to have made supply chains more ethical than they were before the digital revolution. The data is still grim. There are 45.8 million people still suffering in conditions of modern slavery, often working on tea plantations, seafood ships, poultry farms or factories supplying global supply chains. Even in the formal sectors, the situation has not changed much. Many more have lost their lives in factory disasters or accidents since Rana Plaza, and if workers try to stand up, they face violence like what is taking place in Cambodia, a major hub of global textile production. "Technology can never be the solution around the fundamentals of human nature." The environment is suffering too. Deforestation is still continuing, and if action isn't taken soon, there won't be any orangutans left in Borneo, among other major problems. The existence of human and environmental violations along global supply chains is not a problem of technology but a problem of the wider global society. "There are so many variables that exist ... governance, corruption, shrinking of civil space," said Moote. "You can't decouple those trends; they impact the utilization of technology. Technology can never be the solution around the fundamentals of human nature." The problem may not be that we don't understand the origins of our products but rather whether understanding is enough to make industry, consumers or governments act any differently. Satellites, blockchain tools, artificial intelligence and massive datasets can't solve that. Image credits: MONUSCO / Sylvain Liechti (Conflict-free mine); Getty Images / Barcroft Media (Indonesian fire); Enough Project (mineral pan). Nithin Coca is a freelance journalist who focuses on social and economic issues in developing countries, and has specific expertise in South and Southeast Asia. Coca's feature and news pieces have appeared in global media outlets including Al Jazeera, Quartz, Forbes Asia, SciDev.Net, Southeast Asia Globe, The Diplomat, Vice and numerous regional publications in Asia and the United States.